A constant refrain from those who insist on comprehensive immigration reform – read: amnesty – rather than closing the border as a first step toward dealing with the immigration issue is that the border cannot be closed. That’s nonsense. The border can be closed, but both parties have a seeming interest in keeping it open. Democrats want the border open to usher in millions of people, most of them undereducated and likely to depend at least in part on government, who will presumably vote for bigger government once they are given citizenship. Republicans want the border open to provide cheap labor to big business. Nobody wants the border open to benefit the kind of immigrants that made this nation great: immigrants who want to work and don’t want an overbearing state alternatively cradling and crushing them. So here’s how we can fix the border problem. Build a Wall. Approximately one-third of the US-Mexico border is fenced off. The rest is patrolled by hundreds of border patrol agents, most of whom are centralized in particular areas like Tucson and San Diego. Unsurprisingly, where border patrols are most common, illegal immigration is down most. But as of March 2013, just 15 Border Patrol pilots were assigned to the entire Rio Grande valley, according to The Daily Beast, as opposed to 80 stationed in Mexico. 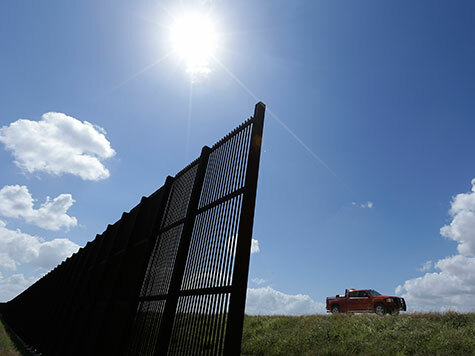 The supposed cost to build a fence that spans the entire border is estimated at some $22.4 billion. Which is not all that much money, considering that the federal government has blown some $154 billion on green energy boondoggles over the past 40 years. In 2008, the feds somehow came up with $20 billion to bail out Bank of America. After the spate of terror attacks that rocked Israel in the early part of the 2000s, Prime Minister Ariel Sharon authorized the building of a security fence in Judea and Samaria. That roiled the international community, but it stopped terrorism almost cold. The Israeli security barrier, if applied to the length of the US border, would cost $6.4 billion – although that cost is low, given terrain differences. Israel’s fence is a combination of electric touch-fence, trenches, concrete walls. A wall would not be sufficient, of course. The Israeli fence is also defended by Israeli military with orders to kill those who attempt to scale the wall. That order would not hold at the border. This idea has been floated repeatedly and used before; in 2010, we deployed 1,200 National Guard soldiers to the border. Of course, in 2011, Obama scaled that back. Governor Rick Perry (R-TX) has been an advocate for this measure. According to some experts, a deployment of 15,000 National Guard troops would secure the border. And there are hundreds of thousands of National Guard troops available for such duty. Given shortages in manpower at both Border Patrol and Immigration and Customs Enforcement, activation of the National Guard is becoming an ever-more-popular option. What would the National Guard do? It would arrest those who cross the border. Which leads us to the third measure. Deport Those Who Cross The Border Illegally. Our current legal system is completely inadequate in terms of achieving deportation. Thanks to Immigration and Customs Enforcement prosecutorial discretion, there are no hard-and-fast rules regarding how deportation is conducted. ICE officers often release illegal immigrants on the grounds that they are either non-flight risks or non-risks to the community. Obviously, that first grounds is often false, given the disappearance of large numbers of released illegal immigrants. Deportations are expensive and costly. According to the Center for Immigration Studies, each immigration judge hears 1,243 proceedings each year, which means that the system prioritizes enforcement of the border only with regard to criminal illegal immigrants. Even for those who have nothing but sympathy for those attempting to cross the border illegally, the presumption of non-deportation means that many criminals will cross the border as well. Fight The Welfare State. An enforced border only becomes necessary in a free country for two reasons: first, safety; second, the possibility of an influx of people benefitting from public resources without contributing an equivalent amount to the tax coffers. Safety concerns will always require a secure border. But those who argue that illegal immigrants largely come to the United States to work are correct – except when they’re not. When my great-grandparents came to the United States, they didn’t know English. They had no money. They integrated, learned the language, and became productive workers. That’s whyimmigrants make America great: because immigrants are self-selected members of the world community who want to be part of the American experiment in self-government, self-control, and self-determination. A welfare state not only undermines what America is and enervates those who are born here, it makes it impossible to distinguish immigrants who wish to be part of the American dream from those who wish to take advantage of the welfare state. The greatest sacrifice America could make on behalf of illegal immigrants would be to do away with the welfare state so far as possible, thus making moot the question of why illegal immigrants would cross the border in violation of law. All immigrants would be a benefit rather than a potential cost. And those in America who don’t wish to build will leave. That is the immigrant America we used to be. And that’s who we can be again.